One of my favorite pre-school children's arts and crafts television programs is Mister Maker produced by BBC. A bright and energetic young man with a quirky sense of humor, Mister Maker is always busy doing something creative. Sometimes he finishes a whole project under a minute. At other times he wakes up the colorful shapes (circle, triangle, square and rectangle) to do a silly song and dance, then picks one of them to form a picture. 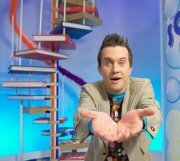 Whenever Mister Maker works on a project with his pre-school audience, he warns them: "Be careful, the scissors are sharp." I love this. In time, I have even started warning myself about the dangers a pair of scissors can cause whenever I work in the kitchen or the study. This friendly warning tells us -- it is necessary to face the risks in life, but we can do it if we remain cautious. And I think of Mister Maker's words whenever I check out the weekly bestselling ebook lists provided by Digital Book World (DBW). Instead of scissors, what comes to mind is: "Be careful, the readers are sharp." Launching the lists on August 20 this year, DBW has taken into consideration the different pricing strategies posed by publishers of ebooks. Apart from an overall Top 25 list, the bestselling eboks are divided into four price ranges in U.S. dollars -- $0.00-$2.99, $3.00-$7.99, $8.00-$9.99, and $10.00 and above. And the results are very interesting. A quick look at the Top 25 list reveals the big six publishers are still dominating the ebook market. And these ebooks are not cheap -- nearly all are above $5.00 and most are between $7.99 and $12.99. This may come as a shock to those who are accustomed to buying ebooks from Amazon at the price of $2.99 or less. Still, it shows readers are willing to pay if they trust your reputation and the quality of your products. The pricing strategies adopted by publishers are also an important contributor to the popularity of their books. As anyone can reasonably assume, newly published books are generally cheaper in order to grab the attention of readers. Meanwhile, whenever an old release (read: prior to 2012) becomes popular, it is always when its price has dropped to below $5.00, even to as low as $2.99. This makes me think of the constant readers out there who are like hunting cats watching at night, their eyes sparking green in the dark -- whenever there is sign of a vulnerable prey, they pounce! But obviously my personal observations are not as professional and insightful as those provided by Mike Shatzkin, who suggests DBW's bestselling ebook lists "deserve to be treated with respect and analyzing what they tell us is worth the effort". This is because these lists not only derive from the sales numbers provided by ebook publishers, but have also taken into consideration those important factors such as "different rankings (power law curve; sales drop sharply as ranks drop) and different account sales power (number five on Amazon almost certainly sells more than number five anywhere)". As Shatzkin sees it, the most interesting finding out of DBW's bestselling ebook lists is that even among those ebooks at lower price ranges such as $0.00-$2.99 and US$3.00-$7.99, the big six publishers dominate. This not only shows the big six publishers are not pricing their ebooks too high, but the low prices are actually benefiting the sales of the ebooks. Does this mean the big six publishers actually have better pricing strategies than they are generally thought to be, when it comes to publishing and marketing ebooks? Just because they are the so-called "traditional" publishers, it does not mean they are anywhere behind those at the cutting edge of this brave new world of digital publishing. One would assume that when publishers make more money, those authors publishing through them will benefit as well. However, as Mark Coker argues, compared to many indie authors who can get $1.80-$2.10 out of each copy of their ebooks sold at the price of $2.99, those authors who publish through the traditional publishers are "at an extreme disadvantage" because they earn only $1.25-$1.75 out of each copy of their ebooks sold at the price of $9.99. I would imagine the traditional publishers can sell more ebooks than what indie authors can do, as the big guys often have the money and power that the small guys lack. However, using the examples provided by Coker -- if a traditional publisher and an indie author can both sell 10,000 copies of their ebooks, then an author working with the publisher can make $17,500 out of the $99,900 earned by the publisher, while an indie author can earn $21,000 out of the $29,900 received by whatever ebook publishing platform he or she uses. Bad luck for those authors working with traditional publishers, right? But how about the advance royalty payment an author can receive from his or her publisher? More importantly, how many indie authors can sell as many as 10,000 ebooks? Stories of success do exist, but they are extremely rare. So, perhaps the best strategy an author can have is not to limit their choices. Be sharp, as scissors and those constant readers out there are, and take the best publishing option whenever one becomes available. As indie author Joanna Penn wisely suggested when she signed up with a literary agent and thus shocked many fellow writers who have chosen the self-publishing path: "I am an author and an entrepreneur, so my goals center around (1) Creating great books and quality products; (2) Building a long-term career; and (3) Growing a sustainable income." In other words, wherever there is a way to publishing, there should be a will to take it. Two roads diverged in a yellow wood? Who says one cannot travel both?